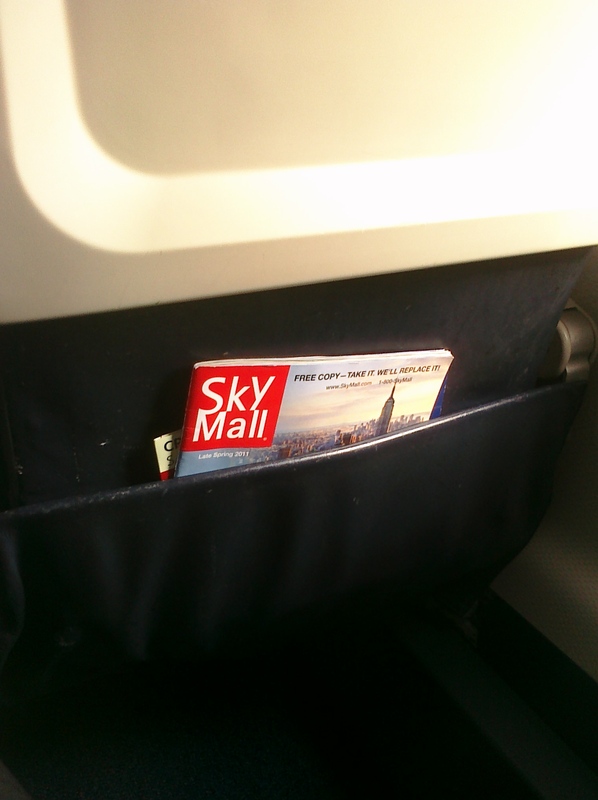 SkyMall is the catalog that’s in the back of airplane seats. It’s what you read when you forget to bring a book or a magazine or the free USA Today from the hotel and you’ve already thumbed through the in-flight magazine, twice. What’s interesting is that SkyMall has built a successful business (it’s been around since 1990) selling things no one especially wants (such as a 4-foot replica of the Eiffel Tower for $199.99) in a location where it’s pretty much impossible to buy things on impulse (8 miles above Mississippi). It’s hard to imagine buying a 28-inch garden sculpture of Bigfoot ($115), for example, if you’ve had a few minutes to think it through. Of course, not everything in SkyMall is nutty or ironic. I wouldn’t mind having a seat from Yankee Stadium ($799.99) or a boxing glove signed by Muhammad Ali ($1999.99). Head massager ($49.95). The catalog says, “This patented Italian design incorporates Japanese engineering and utilizes acupressure to relax and soothe your problems away.” It also looks like something that’ll wind up as a prop in SyFy channel movie. Toilet-seat adapters for potty-training your cat ($49.99). A 6 foot-by-2 foot photo of the Cincinnati skyline, at least not at these prices ($319 unframed, $499 framed). Shower head studded with color-changing LED lights, to “create a spa-like environment in the comfort of your own shower,” assuming you shower in the dark ($49.99-$59.99). 6-foot replica Easter Island monolith ($995). I can imagine someone buying this as a temporary decoration for a pool party or cookout, but $1,000 is a high price for irony. The Encyclopaedia Britannica ($1,395). We’re talking 32 hardcover books that are so bulky, there’s an extra $40 delivery charge. When I was a kid, my parents paid a small fortune for a set of World Book encyclopedias and annual updates, but this was before the Internet. OK, Wikipedia isn’t as authoritative as the Encyclopeadia Britannica, but it’s awfully useful (and cheaper), and it can point you to better sources online (that are also cheaper). SkyMall seems to understand this. It also sells a set of 3 different versions of the Encyclopeadia Britannica — aimed at elementary students, teens and adults — on DVD-ROM for $39.95. There are actually a couple things I want from SkyMall. I want the thing that turns photo negatives into digital photos. I wouldn’t mind the bed frame they have with drawers underneath (but not for the price). And a friend of mine actually has the $300 motorized litterbox thing. But I don’t know if she got it from SkyMall or somewhere else, though. Does the $300 motorized litter box work? Would your friend admit it if it didn’t? My sister actually has one of those….but her house still smells like cats. Ew. Congrats for being freshly pressed! Believe me, every time I travel and browse the magazine, same thoughts circulate my mind-Why should I spend such big chunks of money? ?for stuff seemingly ‘cool’ useful or not. Yeah, that zombie thing is funny. Overpriced, but funny. I thought those zombies were cool. I’d buy one if I had a larger backyard – plus they might be good for Halloween. I like reading the Sky Mall purely for the entertainment value. I always find myself thumbing through them when I fly, mostly out of curiosity. @Chad, I agree, it’s definitely entertaining! yea same here..it always gives me a good laugh! Don’t waste your money on the negatives to digital photos thingy. My kids bought it for me and it was awful. Had to send it back. It was from Hammacher Schlemmer, right out of SkyMall. That zombie guy freaks me out everytime I see him in the catalog. I can’t imagine buying it and seeing him in my garden everyday. I have a zombie phobia. I do like the virtual reality headgear. It would be cool so long as there are no zombie’s in the virual world. Ugh..zombies. Congrats, Todd! You’re FP’d AGAIN! You are officially my most “ironed” friend…well done! A lot of the stuff in the catalog is kind of cool, but not at that price. I could see having a cooking-pot stool in the kitchen, but I wouldn’t pay $395 for a cooking-pot stool unless it cook — and do the dishes. Check out http://www.hedonics.com the Canadian version of Sky Mall. Sky Mall will ship to Canada but you have to watch the shipping charges. Usually I get pretty excited by anything with different color lights, but even I raise my eyebrows at the shower LED. I was recently on a flight where the man in front of me was with two teenage girls who must have been exchange students (I hope) and he was their teacher (I hope). His explanation of the SkyMall catalogue was entertaining. How does one explain the American “need” for an Easter Island monolith replica? He did his best, but some things are just beyond comprehension. Congratulations on another Freshly Pressed! Sometimes, I’ll see that some cheesy product was made in China and I think, What must the Chinese factory workers think of us? Well, I live in China and I guess the Chinese think most foreigners are a bit off but still pretty cool…. I’m looking forward to a ten to twelve hour flight in juli and I’ll definitely check out that easter island thing, would be great for my non existent garden/balcony/any thing it would fit in! That’s great. I was just flipping through those mags the other day and thought about the same thing. Who buys this stuff? I have no idea … but wouldn’t it be cool to have a seat from Yankee stadium? I don’t even like the Yankees, and I think it would be cool. Another FP! You’re on fi-yah! Oooh, my parents bought those World Book Encyclopedias, too — must’ve been a good day for some salesperson! Now try getting rid of ’em; even the public library doesn’t want them! I know. My grandmother had a set of 1950s-era encyclopedia, and when she died, I think we threw them out. or a really neat side table. Toilet-seat adapters for potty-training your cat ($49.99) <—-I am surprised that such a product even exists….! I’m surprised that anyone would try to toilet train a cat, with or without a special adapter. I know two people that have trained their cat with the toilet seat adapter. I have even seen a cat using it – it was a very disturbing sight. Cats and toilets are too incongruous! Also the training takes ages because cats (very sensibly if you ask me) are afraid of hovering over a large opening filled with water. Haha. Great post. You’re right, there is plenty of useless stuff in that magazine, but hey if you’ve got an extra dollar, why not. Congrats on Freshly Pressed. The Skymall catalogue was one of the undoubted highlights of my transatlantic flight to New York. Simon, please don’t judge us by the things in SkyMall. That much for the Cincinatti skyline? I need to hone in on my photography skills. Yeah, forget this writing thing. The real money’s in oversized photos of Midwestern cities. What’s funny is that I read a while back that a survey was done between Encyclopedia Britannica and Wikipedia and found more mistakes per article for Britannica than Wiki! Hi, thepersiancloset! I remember seeing that article, too. I was surprised by that. I’m always a little wary of Wikipedia, just because anyone can edit it. Several years ago, someone went on Wikipedia and, as a joke, changed a prominent Nashvillian’s biography to say he was a suspect in the Kennedy assassinations. It was national news. No one thought it was funny. Some days I’m tempted to open a page on Wikipedia explaining how Henry the Eighth was really a woman from Wisconsin named Beryl. It wouldn’t be up for long, I’m guessing, but probably long enough to feature in a few history lesson essays across the world…. I have never known anyone who has actually purchased something from SkyMall. However, if I had unlimited income I would own like 5 of those Easter Island statues. That would be cool, just line ’em up in the backyard. No! Line ’em up in the backyard facing your neighbor’s house. He’d go out back and there would be this 5 giant heads, staring at him. I don’t think I have ever been tempted to buy anything from the air mags. I never buy anything without googling it first. The sky mags are usually so expensive. I know. It’s strange stuff, and it’s expensive, but SkyMall’s been around for more than 20 years, so it must be doing something right. Yes, but have you ever been tempted to take the magazine home and order something? We have you covered, thecastrovas! Too funny! The head massager looks like something from a sci fi film. Something that would either erase your memories or turn you into a mindless soldier. Such crazy prices…makes me wonder if people in First Class bought this junk. I have no idea who would buy that one, gothichydran. Actually, my wife could use something like that. She tends to suffer from aches right where the pads are place on the neck and head. I don’t want to say how much time I’ve spent doing acupressure on her temples and the back and sides of her neck. This is a device I would buy, regardless of the look! I’m tellin’ you, line them up along the property line and stare down your neighbor. There is way TO MUCH stuff in this day and age. I know being a victim of it! I agree with Amy. I’m looking at that picture of the Easter Island head and I’m trying to think if it would fit in my garden. Or on my roof. I always thought of the SkyMall mags to be like tabloids about some girl having an alien’s baby or big foot sighted. Entertaining as heck but full of crap. Funny! I love flipping through SkyMall. I’ve never gone through and bought anything from them, but I kind of want the lovely white-picket-fence air-conditioner screens they sell. Oh the things you can buy with an obscene amount of money!!! Yeah sky mall at 36,000 feet impulse buying. Unique blog. Come read my blog on wordpress sometime. lol. love the toilet seat adapter for the cat. i hear they work! 6-foot replica Easter Island monolith ($995)… what was it made out of? It could be fun to have in a garden… Not mine, because it looks bigger than my garden. And for the low low price of $995… only has me wondering how many easy payments of $19.95 that will be. 🙂 Great post. The sculptures are the most gaudy and useless things I’ve ever seen advertised. However, I might try the cat toliet traing device. I hate cleaning the litter box and one of my cats seems trainable enough to use it. I LOVE looking at this magazine and “smirking” then wondering if the things work . . .good blog! The Head Massager looks like something Lady Gaga would wear. It might be the cabin pressure that makes you think an Easter Island monolith would be a good idea. Anyway, no flight would be complete without the SkyMall catalogs. They must sell a lot of those personalized coir doormats. I’ve seen them in every catalog. While some of these are funny or useless (and certainly overpriced), the toilet seat adapter is actually used by some people with cats, because they can be potty trained (at least some cats can be) and it frees you from the dreaded litter duty. However, as cats age they may not be able to make it up to the toilet any more, so at some point you’ll still have to deal with litter. I spent 17 hours on a plane from Italy…it was stocked with most of the items available in that magazine…If you can believe it. I opted for the duty-free liquor instead. i’m flying out early tomorrow, and i’ll have to hold back on ordering the Easter Island monolith. Congrats on the Fresh Pressing. Hi Todd, I really like of what you say and I, do read magazine alot of time. But I only see sky mall magazine through flying an airplane. I never buy any of those things. I just only flip through pages, until I find something scifi, and talk to you soon Todd!!! If you are a member of Cambridgeshire Libraries (in England!) you have access to the entire Encyclopaedia Britannica on line for free (all three age levels/versions included). This is a much better bargain. Congrats on being freshly pressed – and I must admit to desperately wanting the huge blow up garden projector screen. Ahhh. hahah i knwo they are useless but i love reading that whenever i am bored. Fun to see what new things they have come up with . Youre right about the head massager. It screams for spandex clothing and a ray gun. You forgot about the wall sized crossword puzzle…oh wait…I just might by that! That thing is 9 feet by 13 feet. You sure your wall is big enough? Color-changing LED lights create a spa-like environment?! Which spa would that be? The one inside TAO Las Vegas? Funny you should mention that color-changing shower head. Just a mere week ago, my boyfriend brought home the skymall catalog and declared that that very shower head was “the coolest thing he had ever seen” and would be purchasing it for his fraternity house next year. I, like you, found it a little weird, but hey, at that great price!! I wonder if people really buy that stuff? I guess if you have a lot of money you’ll buy anything! Congrats on being Frehly Pressed! Isn’t that catalog the one that has plastic things that cover your entire head so if there’s a fire in your hotel, you can escape? And some kind of rope thing you can throw out the hotel window for the same reason? Why do I travel so unprepared? The massage device is the first step of the cyberman invasion! Noooo! I love how you said after you read the In-Flight magazine twice. I just did that … “oh, I’ll just read this thing again … maybe I missed something captivating!” rather than the alternative Sky Mall catalog! Congrats on having “whatever comes to your mind” being Freshly Pressed! I think there’s a Skymall subculture! Congrats on getting WordPressed, Todd! Love this post, though I am a little disappointed that I can’t swing the $995 for the 6-foot replica Easter Island monolith. I’m so excited to see a Freshly Pressed blog from an often-commenting blogger on Blurt!!! That’s it, I’m subscribing just by virtute of the fact that you know Oma. The best Sky Mall offering I ever saw was life-sized bronze Sasquatch lawn ornament. Great post. And I forgot to look in the Skymall catalog on my last trip. DARN! Look at you – FP’d again. Go Todd. You don’t have to buy a toilet seat adaptor for cats. If you hold the cat on the toilet for long enough, they’ll eventually have to go to the bathroom into it. Nice try, SkyMall. I can force my pets to go to the bathroom wherever I want without your help. I bought a large remote spider from sky mall once. Don’t ask. They bugged me non stop for years there after. The big guy is cool but I agree the price is a little steep for your average Tiki party. Hilarious! The folks over at SkyMall really do have it all figured out. When you are insanely bored and have entered your seventh hour of in-flight delirium, it’s easy to convince yourself that, yes, you do need that 9’x13′ laminated map of the United States (and yes, it comes with a dry-erase marker!). It’ll fit perfectly on your living-room wall, after all. And you friends will all be jealous about how far you’ve moved up in the world. Yep. Genius. Thanks for sharing! I love reading the SkyMall catalog. I’m amazed at all the zany stuff they offer. It makes me wonder if the things work, do people really buy the stuff, and where the heck do they find it all? Just when I start getting bored and begin over-thinking that I am a gazillion miles above the earth in a metal tube there is a Sky Mall magazine to reassure me that not only is someone sure I am going to survive the flight but I am going to have lots of disposable income. I like it! How about the James Bond page with the Bluetooth-like device that lets you listen in on conversations over 50 feet away! Who wouldn’t want that!! And the Jumpin Jammerz. The footie pajamas for adults who can’t grow up. Creepy and so great!!! I love SkyMall. That is great. How about the “pillow” that you put on the tray table and lean forward on? Lol that pillow looks so silly and it’s so bulky. It would count as your one carry on. It’s probably really comfortable though. Funny, but comfy. I couldn’t help noticing, and enjoying your blog. Having just had my first experience with Sky Mall iI found it a highly entertaining mixture of things you would want and things you would never think anyone would invent! My partner particularly like the freestanding head rest you cam place on your plane table so you can sleep more comfortably, which ‘travelwithlaughter’ has mentioned. I know what i’m getting him for his birthday now thanks to Sky Mall 🙂 although whether this will be a welcome surprise, o particularly useful, remains to be seen…. Little did you know that the head massager is actually the same device that Xavier uses in x-men. I’d pay a measly 49.95 to enhance my mind reading capabilities. I’ve seen these exact ads in this month’s SkyMall and thought exactly the same thing! Brilliant observations, thanks for sharing. I have often wondered if anyone ever really bought anything from SkyMall? Interesting blog and congrats on getting pressed! Spot on my friend. I would never buy those six items either. That head massager – never saw that ever in the Sky Mall catalog. Way Wacko! I can’t imagine having that head massager on for any more than 10 seconds before screaming AAUUUGH! GET IT OFF! GET IT OFF!!! SkyMall has some really interesting gadgets. My first job when I turned 16 back in ’93 was a summer job at SkyMall in Phoenix and we used to play with all the crazy things they sold back then. The things they have now are even more interesting. One thing for sure is the prices are still way too high for almost all of the products they sell. My daughter would really enjoy the Easter Island statue since she is a SpongBob fan but at that price I’d rather take her to Easter Island. “Irony” would not be the word. Sorry. just bugged me… otherwise, a fun read. Omg, this was so funny. I haven’t been ready freshly pressed for so time now, but wanting to check my blog traffic your post first caught my attention. I’m impressed (read jealous) that you were able to write something so funny yet true about a stupid airline catalogue. I was thinking exactly the same thing when after watching all I could watch I had to finally resort to reading the damn thing. Ridiculous, it does make you wonder, do people actually by ANYTHING in there? Me, bringing on the dorkiness, but that first head massager looks like the device that the people on Dr. Who wore before they were turned into cybermen (women). Yeah, I said it. Yeah, I’m NOT ashamed!!! Thanks for this awesome blog. Congrats, I’m now your subscriber! i did think that led light was cool. but not the price!!!!!!!! Give them time; they will have the magazine turned into a touch screen on the back of the seat with one-click ordering billable to the card you used to pay for the flight. Then it will be a race to see what you get first: your Sky Mall items or your luggage. the Bigfoot is my favorite skymall item. Loved this post! congrats on FP! Have to admit being bored on my flights I have purchased some of those foolish things before. Grateful to your Canadian commentors for explaining why I’ve not seen this epic publication on any of my long-haul flights to and from Vancouver. I’m tempted by the Easter Island Head, but I always am (I’ve seen smaller ones in Garden centres and the like). Am I hoping that people will see them in my garden and believe I’ve had them shipped in from Easter Island? Or will the mystic deities they represent smile on my begonias? Congrats on being FP’d (twice)! I travel a lot, and sometimes I’ll see the aromatherapy alarm clock or the japenese-style bedroom set and think “oooh, that would be nice, I want that!” But, like you said, I’m totally over it by the time the plane lands. Although,the alarm clock is the thing I keep coming back to, so I may just have to give in to that one. Oh my…that head massager totally can be in a sci-fi film. Lol. The funny thing is my sister just got back from vacation and took the skymall magazine and brought it out to my dads. We talked long and hard about the cat potty training kit they offer. Not considering buying it (oh no) but just about how exactly it can work. She has a friend that swears by it and now his cat uses the toilet. Weird. There’s a stonehenge recreation deep in the heart of TX…perhaps they bought the sculptures from SkyMall…always wondered. I love that picture of the Easter Island monolith. What REALLY cracks me up is that kid though. He is standing next to this crazy statue, but he is pointing with excitement at something that is even BETTER than that! What could it possibly be??? I LOVE Skymall. During that last seemingly interminible hour of a long haul flight I have used it to devise all sorts of mental games. These include “who do I know who deserves THAT for a Christmas gift”, “who do I know who probably already owns something that cheesy” and “what crazy idea could I think of to entertain house cats”. It has never occurred to me that people must actually buy stuff from Skymall. Sky-mall also has a lot of spy gear, which I feel is creepy. Is there really a big demand for average people to spy on others? Congrats again Todd on being Freshly Ordered, I mean Freshly Pressed! Great post; I love it! Congratulations on being Freshly Pressed! Since you left them off your list, does this mean you would buy the cubic zirconia earring/bracelet/necklace set and the watch with 17 different colored straps and circles? Great post that we can all relate to. Congrats on being FP!!! And why can you tell me that there are at least 3 times of dog sounds machines, to prevent barking…one isn’t effective, I guess! I know people who have purchased the toilet training cat litter kit, or whatever it was… and they swear it works! However I already share my toilet with training toddlers and an adult man, I don’t particularly want to flush cat poo with every trip, or wipe off the seat where they missed. Pretty cool article. It is interesting indeed that the magazine people read only when there isn’t anything else could be so successful. It is probably something that should be taught in most Marketing courses in Universities, if it isn’t already. Thanks for coming by, I was told there would no math (great name, by the way). You don’t have to actually smuggle it off. It says on the cover you’re allowed to take it, but I think people smuggle it, anyway, because they’re too embarrassed to be seen with it. Or, maybe that was just me. Ive been flying once a year for every year of my life so far and almost everytime at somepoint I find myself grabbing and reading a skymall. Then begging my parents to get me one of thd gadgets/gizmos. But tragicallly they ALWAYS say no. I’d listen to your parents on this one, a hundredthingstodo. I mean, where would you even put a 13 foot-by-9 foot map of the world? HAHAH, you got a few things I didn’t when I was last perusing SkyMall. I actually did a post about it a while ago. (http://notacrazycatlady.com/2011/03/02/today-id-like-to-interest-you-in-a-few-high-end-products/) I do disagree on the cat toilet trainer thing…I’m pretty sure I might be buying that soon. Ok, I’ll be honest, if I had more money I would probably buy a lot of stuff from the dumb SkyMall. I don’t know, if the toilet seat cover worked for mountain lions too, I may buy it. Where have you flown that you see a Yankees seat in that magazine?! Atlanta, but it’s the national edition of the catalog. It’s online, too, if you’re looking for a seat from Yankee Stadium. The funny thing is that every time I’m on the airplane, listening to the man next to me snore and the kid behind me kick my seat, i feel I need some of those really useless things. Luckily, by the time we get down to a lower altitude, my sanity returns! Lol I didn’t know they had those magazines.